My desire here was to do a homage to the local loggers I know through an updated tribute to Winslow Homer, one of my favorite artists. This watercolor sketch, therefore, is a 21st century update of a Homer work, but in my own sketchy impressionist style. 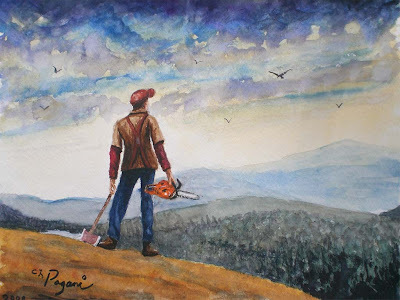 The name was originally Oregon Logger from Woodsman but then along came the History Channel's TV series Ax Men. As coincidence would have it, I actually know a few of these guys. The show is great but WAY dramatized to the hilt. It's still good, though And btw, nobody calls them "ax men" in this part of the world. They are loggers. Alas, the original painting has already been sold and is in a private collection. I didn't really even have a chance to enjoy it myself! Fortunately, before it disappeared I managed to have it made into framed prints and posters. They came out pretty well so now I own two of them. I'm reading: Ax Man WatercolorTweet this! It has lots of atmosphere.